The winning combination of strawberries, brown sugar, and sour cream flavors these whole grain muffins, with an extra boost from soaked oats. Forget your shortcakes, your chocolate coatings, your balsamic glazes. For me, the best way to enjoy a fresh local strawberry is to grab it by the leaves, dunk it into sour cream, then plunge it into brown sugar. Then get out of the way of that strawberry as it gets into my mouth! I don't share well sometimes. Sadly, the local strawberry season is over in the blink of an eye, and the Certified Wildlife local varmints attempt to pilfer my backyard patch even faster. I have learned that I must gorge myself on strawberries, sour cream, and brown sugar as soon as the berries come into my house, and if any are left over I bake with them. If you manage to put any strawberries up, this recipe will also work with frozen berries, or slightly older, softer berries, as you're going to smash them anyway. 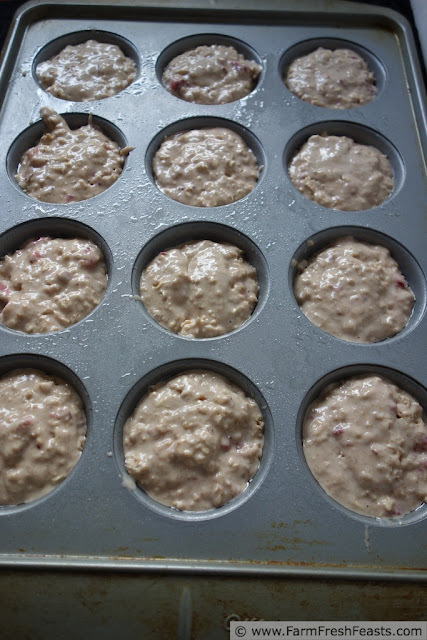 It's yet another variation on my Soaked Oat Muffin recipe, which I need to update to include links to some of the muffins I'm enjoying. Like this one! Remember that this recipe is best after the oats soak at least an hour and up to overnight. You can even combine the oats and buttermilk in a container in your fridge for several days before use. I wanted to share how our household generates very little waste with the strawberries, so I thought I'd pose the composting pigs in the strawberry patch with the strawberry tops. 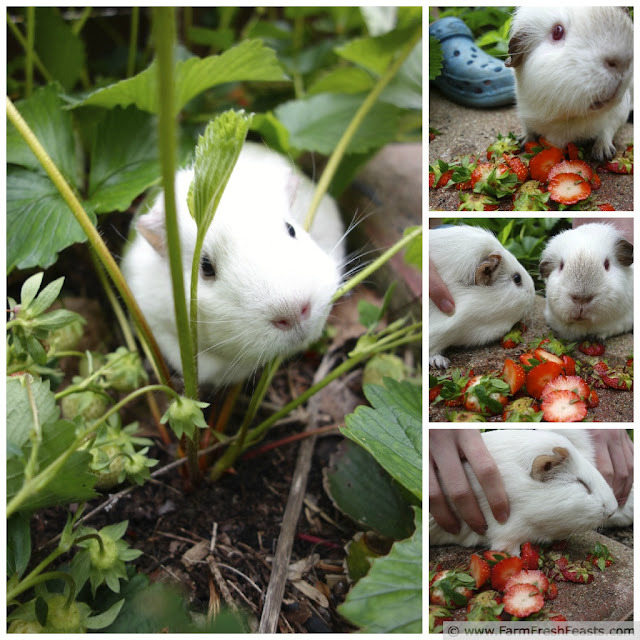 The pigs were not informed of my plans, and ran amuck in the strawberries instead. Did you know pigs will eat the plants, too, not just the fruit? Now you do. In the future, they can eat alfresco only in the clover. For more recipes using strawberries, please see my Strawberry Recipes Collection. It's part of the Visual Recipe Index by Ingredient, a resource for folks like me who think that strawberries shipped in from Off taste like water, and prefer to eat strawberries that taste like . . . well, strawberries. I'm pinning lots of berry and other recipes to my Pinterest boards, follow me there. I'm sharing the progress of my own strawberry patch (can't get more local than the back yard) on my Instagram feed, follow me there. I'm sharing articles that catch my eye on my Facebook page, follow me there. Want to know How to Use This Blog? 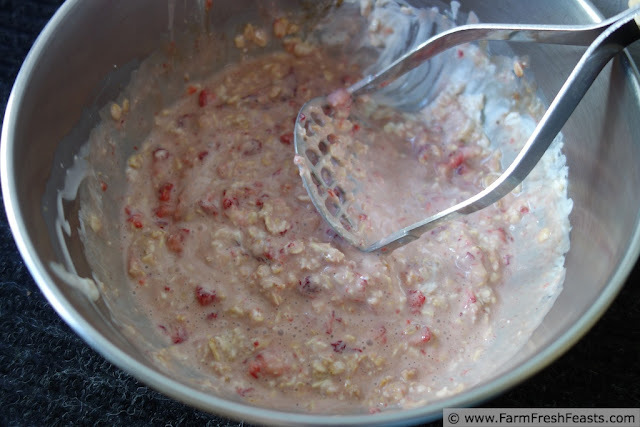 In a large bowl, combine oats and buttermilk. Let it sit on your counter for at least an hour, up to overnight (or you can prep this step up to several days in advance and store in the fridge). When you're ready to bake, preheat the oven to 400 degrees Fahrenheit and spray a muffin pan with oil. 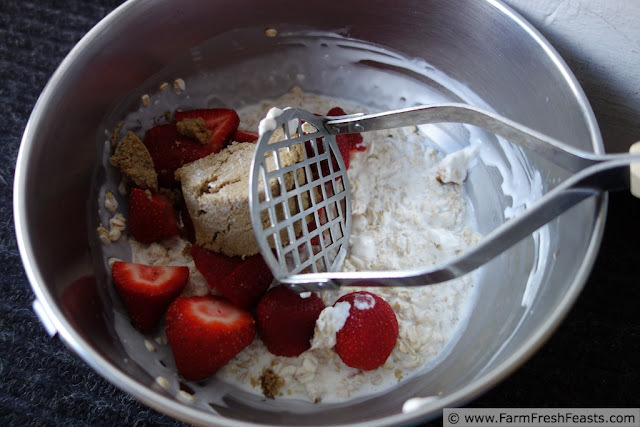 Stir sour cream into the oat mixture, then add strawberries. Mash them well (I used my potato masher) then add the oil, brown sugar, egg, and vanilla. Dump the dry ingredients on top, and stir until just combined. Scoop** into the prepared pan. Bake 15-18 minutes until done. Cool in pan 5 minutes, then transfer to a rack to finish cooling. Serve warm (the butter gets all melty) or at room temp. This muffin recipe is joining the clever chicks at the Clever Chick Blog Hop, TastyTuesdays, the Wednesday Fresh Foods Link Up, What's Cookin' Wednesday, What's In The Box--the traveling edition, and the From The Farm Blog Hop. Simon was very curious about the photo shoot. 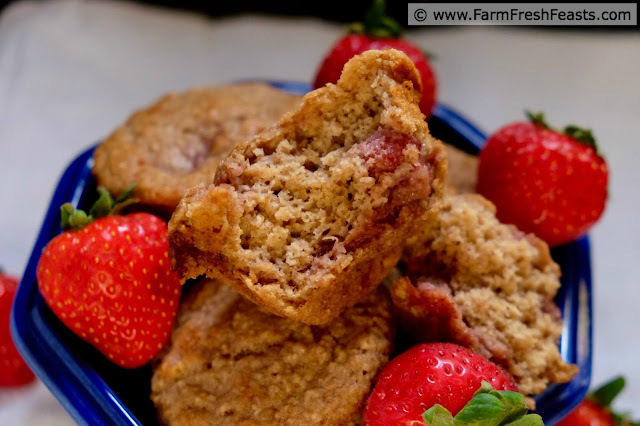 These look and sound wonderful...really, what could be better than the combination of strawberries, brown sugar and sour cream in an oatmeal base. Thanks for sharing your recipe...and the photos of the cute little "varmints" eating the left overs. I appreciate your kind words. Thanks for stopping by! Perfect recipe for now. Thanks! And thanks for the giggle about the guinea pigs eating your strawberry plants. They look so innocent, too! ;) Hope you got them before they ate too many plants. Thanks, and thanks to Meghan for encouraging me to post it now, and not the summer soup I'd planned. My daughter was right in there with the pigs, so only a leaf was destroyed, no worries. We're harvesting strawberries every few days, and have put some up. You even included the pat of butter! Be still my heart. These look amazing, and I already know your buttermilk oats recipe is a hit, so I'll be adding these to the list along with the chocolate raspberry muffins. I don't even know which ones to make first, which I'm pretty sure is a good problem to have. 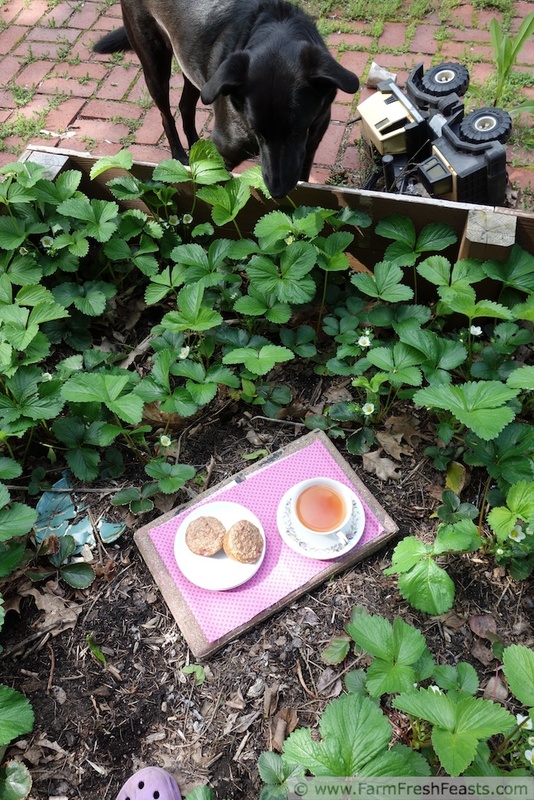 Please note that the pat of butter was melting, which means that I managed to set up the shot and take a few of un-buttered muffins, plus a candid of Simon investigating, all before I cracked the muffin open and buttered it, and in the immortal words of Maurice Sendak: "it was still hot". That's some mad skillz, there. I just wish I'd fixed the fabric . . .
Too many muffin recipes, too little time is a good problem indeed. Love the pictures! 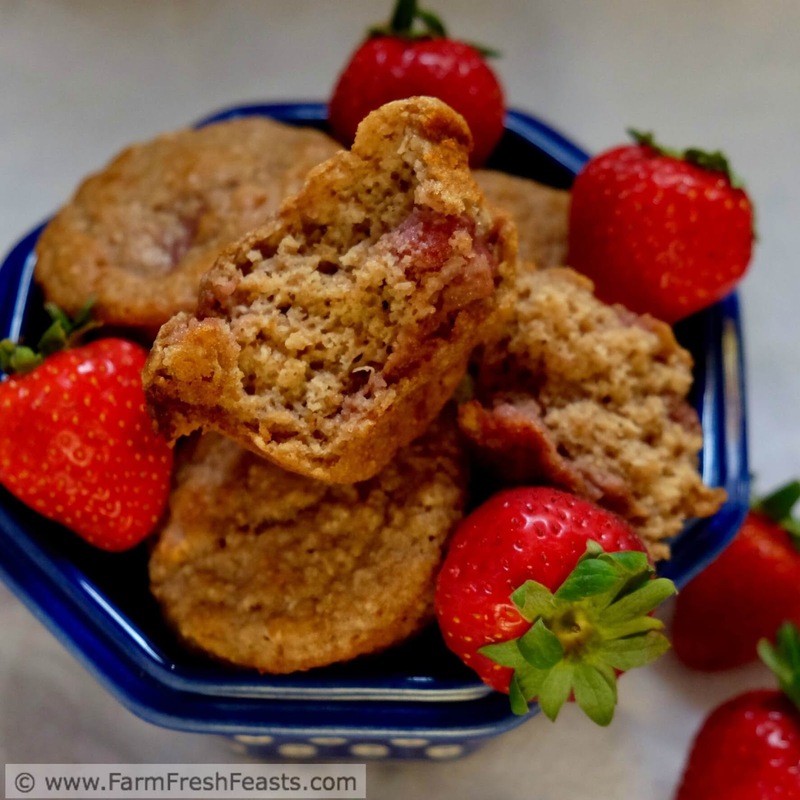 I love strawberries, and these muffins look amazing. Thanks, Kirsten! I'm delighted the photos turned out, despite marauding pigs and photobombing dogs. 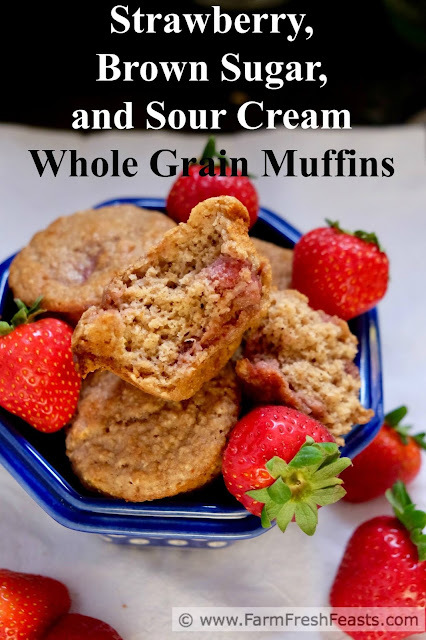 Your sour cream/strawberry muffins look just amazing. My mouth is watering and I can't wait to try them. Thank you for sharing with the Clever Chicks Blog Hop this week; I hope you’ll join us again! If you try them, please let me know how they turn out. Yes, yes yes!Also on the menu for next month! :)You're my July meal planning so easy! Thank you so much for linking up with me this week at Tasty Tuesdays! I’ve pinned this & shared it with my followers! Thanks so much--I appreciate it! Thanks for linking this up at Tasty Tuesdays! Thank you so much! The pigs sure are interesting critters. The rescue where we adopted them from just benefited from an ebay charity auction of guinea pig scale mail armor. So cute! I am a sucker for all things strawberries so these are next on my list for a delicious summer treat. Strawberries are the perfect introduction to the season of fresh produce.